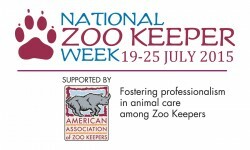 This week is National Zookeeper Week and Moody Garden’s Life Science and Exhibit Operations department has taken this opportunity to recognize the dedication and hard work that goes into this challenging career path. Moody Gardens would like to thank each and every person on our team for providing the highest level of animal care and well-being while creating personal connections between our guests and our conservation, education and research efforts. The LSEO management team recognized 6 individuals with outstanding animal professional awards. 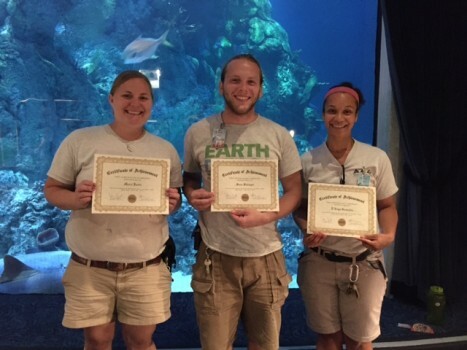 These employees have had a significant impact on Moody Gardens through outstanding dedication, competence, conscientious performance, excellence in engaging guests and ingenuity. The 2015 Outstanding Animal Care Professionals are: Dave Brossette, T’Noya Gonzales, Karen Holcroft, Marci Kurtz, Maggie Reynolds and Sean Salinger. As evidenced by their dedication to their job, only 3 recipients were present at the awards lunch on Tuesday, 21 July as duty called the others away. Marci Kurtz, Sean Salinger and T’Noya Gonzales receive their recognition. Previous Previous post: Shark Finning Banned in Texas!